They must be because the “Bank of America Winter Village at Bryant Park” officially opened on October 28th for the season. Beyond being my favorite Holiday market in the city, Winter Village has so much to offer. The seasonal market’s main focal point is the 17,000 square foot ice skating rink (did someone say free? ), but there’s also indoor activities to keep you warm like an observation deck where you can play a variety of games and a restaurant with a view of all the skating fun. Personally, my favorite feature of the Winter Village is the Holiday Shops. 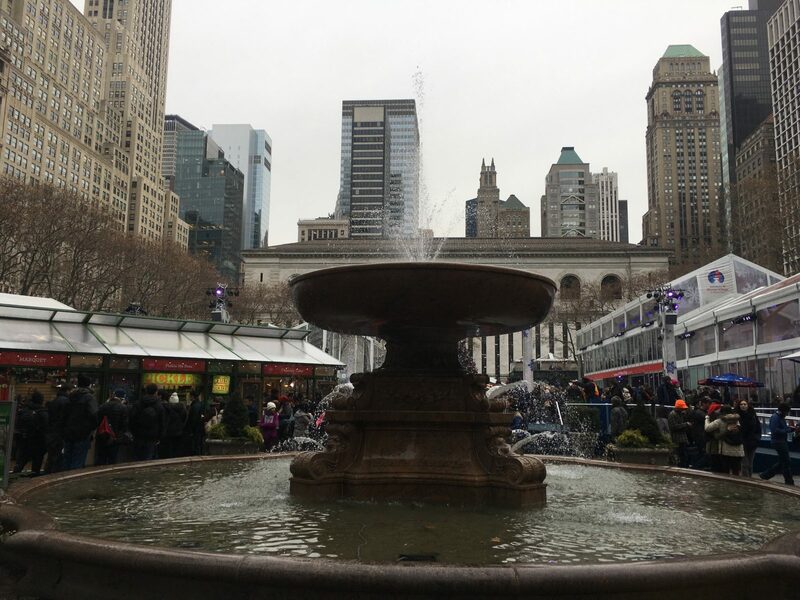 If you want to spend all your money or if you just want to window shop, Bryant Park is the place to be. All of the different boutiques featuring local artists have helped me complete my Holiday shopping in past seasons. If you want to buy a loved one a handcrafted item, one of the hundreds of vendors is sure to have what you’re looking for whether it’s jewelry, candles, customized puzzles, sculptures, or paintings. There is one aspect of the Winter Village that I haven’t gotten to yet, the food. There are dozens of amazing and well-known food vendors located in this midtown market. After reading the lineup of food vendors for this year, I instantly knew that I needed to head over to the market as soon as possible. Payday was this week, so naturally I decided to treat myself on Friday after work and head over to 42nd street for dinner and some dessert. I was SO excited to try out Truffleist’s truffle cheesesteak, but when I got to their stand they had run out of bread and were no longer making sandwiches (guess I’ll just have to go back). I ended up turning to another must-have, Baked Cheese Haus’s Alpine Brat with gooey melted Raclette cheese pouring out the sides. Since I couldn’t resist grabbing some dessert as well, I quickly walked over to JARS by Dani, since I’ve been dying to try one of their desserts in a jar for a while now. The colorful Cake Batter jar called my name and WOW did it not disappoint. Filled with layers of sugar cookie, cake batter filling, frosting and bright sprinkles, the $10 treat gave me a much needed sugar rush to not fall asleep on the train ride home. I definitely say that everyone should take a trip to midtown before the Holidays begin to experience an actual winter wonderland. The market is open through the beginning of January, so head over to grab some amazing food, gifts and have some winter fun.